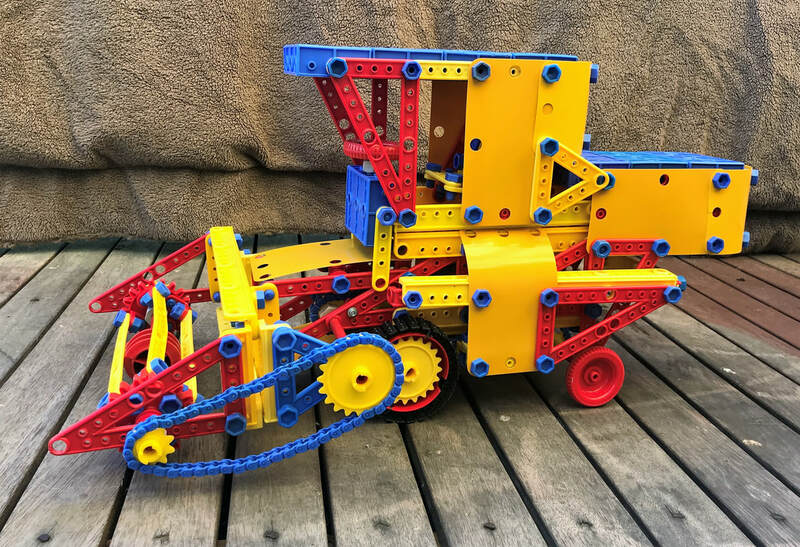 This website is dedicated to one of my favourite childhood toys, Plastic Meccano. As a very young boy I received a Plastic Meccano Set A for Christmas, probably around 1968. In later years I was given a Set C, a 300X conversion set, a caterpillar track set and I bought with my own pocket money an additional Set 100. I spent many hours making models both from the instructions and from my imagination. In recent years I have started making models again with my original Plastic Meccano sets. I have also augmented my collection with several purchases on eBay. This has allowed me to indulge my imagination and build far bigger models than previously possible. Apart from the "Built to Plan" page all the models on this site are of my own design. Plastic Meccano was always the baby brother of the original Meccano but I for one never out-grew it and never fully moved on to "real" Meccano. I like the speed at which Plastic Meccano can be assembled, I love the bright colours and the feel of the chunky plastic parts. And the inherent limitations in building with Plastic Meccano creates enjoyable challenges when trying to design and build the larger models I am attempting these days. Of course time has moved on a long way since my childhood and in fact my Plastic Meccano is often referred to as "Vintage" Plastic Meccano to distinguish it from the modern variety manufactured and sold by Meccano S.N. of France. I'm sure the modern variety is a great toy for today's kids but it has no commonality with the original Plastic Meccano I grew up with. And you can't teach an old dog new tricks, so I stick with my "Vintage" Plastic Meccano.